Tuscarora Mill: These guys do great beer dinners. Think (literally) 'white tablecloth' setting, food, and service, but without the nooty attitude, in horse country Leesburg, Virginia. 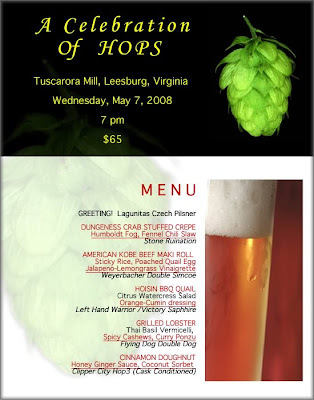 Next Wednesday, Tuscarora Mill hosts a A Celebration of Hops Beer Dinner. It's not a Clipper City Brewing Company beer dinner, but General Manager Shawn Malone, a cellarman veteran of many a Clipper City cask tapping, will be driving a tap into a fresh firkin of Loose Cannon Hop3 Ale. He's serving that to accompany Chef Dinh's Cinnamon Doughnut (!!) with house-made coconut sorbet and honey ginger sauce. Ain't the craft beer world grand? Those beer events in which I'm participating or simply attending, I list in a compendium along the right-hand panel— called Where I'll Be -- For Beer. In it, I had incorrectly listed the date for the Bethesda, Maryland Hard Times Café Spring Beer Tasting. An alert reader of Y.F.G.F., and a big fan of Clipper City Brewing, who lives in Montgomery County, has emailed me and pointed out my error. Thank you! The correct date is Monday 12 May at 7pm. The Tasting is a fun, unique format, and usually features over 10 beers. Read my account of last year's Spring Beer Tasting here. Call the Bethesda Hard Times Café at 301. 951.3300 to make reservations. As the event falls on Monday the 12th, it will be the inaugural event for this year's American Craft Beer Week in Maryland. As reported earlier, Bill Madden —doyen of northern Virginia brewers— is opening his own brewpub, in 2009. At his new blog, Bill has revealed the name: Mad Fox Brewing Brewing Company. Investor Rick Garvin, a nationally-recognized homebrewer, reports that the search for a location in northern Virginia is ongoing and active. The brewpub's name is an amalgam of Bill's name and that of his wife. It's an apt moniker, considering the hunt-country and dressage culture of nearby Middleburg, Virginia. I hope that due diligence has indicated no conflict with Sly Fox Brewing of Pennsylvania. Bill has told me that he has indeed successfully trademarked the name. More on Madden. Greg Kitsock is working on a piece for the next Mid-Atlantic Brewing News about the beers served at Washington Nationals games. To help him out I spent this afternoon wandering around their new ballyard taking pictures. While I was doing that, I spent a few minutes talking with the Nationals Park general manager of Centerplate, the company running the concessions. He told me the current beer lineup is not the final lineup, and additional local craft beer selections are probably going to be added. Old Dominion and Clipper City were specifically mentioned. Another concept that may appear later in the season is a craft beer selection from the home town of the visiting team. "So when the San Diego Padres, say, come to town you'll bring in beers from Stone?" I asked. "Uh huh," he replied, "something like that." But the main reason I'm sending this out is because I thought you would like to know that Centerplate has been getting comments about the beer selection and has been paying attention to what they're being told. And the man ultimately in charge of the beer selection would like the people who care most about what beers they have to tell him what beers they want to drink. That doesn't mean you'll get Belgian tripels or Imperial IPAs at every beer stand because he still has to market to a larger audience, but he does want to know what beers, especially locally brewed beers, you'd like to see at Nationals Park. I was asked if I could suggest any beers that would make "micro drinkers" (he's probably too polite to say "beer geeks") go, "Wow, they have THAT!?!" A few years ago, I ran into Greg Hall of Goose Island Brewery at the Great American Beer Festival. He laughed when I congratulated him on his Gold Medal in the English-style Summer Ale category. "I'm certain to read judges' comments that we brewed ours 'to style'," he said. "Who even knows what an English-style Summer Ale is?" A few days ago, I proudly informed the manager of a Maryland wine-and-beer store that Clipper City Brewing's Winter Storm 'Category 5 Ale' had just received a Gold Medal in the International Pale Ale category at the prestigious World Beer Cup. He laughed, and asked me, "What's an International Pale Ale?" Recognizing the creativity, uniqueness and variety of pale ales produced by innovative brewers throughout the world, entries in this subcategory may represent variations on classic English pale ale or American pale ale beer styles. <...> Many brewers choose to maintain the overall beer character of a particular style [English or American pale ale], but use new hop types, resulting in new interpretations of “traditional” styles of beer which have unique or non-traditional hop flavor or aroma characters. Huh? International Pale Ale appears to be a style in search of a beer. This year, the World Beer Cup recognized 91 style categories. That's a creeping proliferation that dilutes the very intrinsic value and meaning of those styles. I also have no idea why we need 3 different categories for wood aged beer, 3 different categories for Pilsners, 4 different variations for English style pale ale/bitter, and 6 different versions of stout – just to name a few. It is becoming almost as challenging deciding in which category to enter your beer as it is actually producing the beer. In my opinion that kind of misses the point. In the 1970s, Michael Jackson trail-blazed the idea of beer styles for us, promulgating the idea as geographical types. Prior to him, there had been very little formal recognition of such differences. In 1989, author Fred Eckhardt refined that recognition by color, body, and flavor in his concise treatise, The Essentials of Beer Style. Note that Eckhardt employs the singular "Style" in his title. He's describing the manner in which beers are different rather than ponderously listing beer vogues-of-the- moment. The festival has added 11 new styles for this year's competition (Denver, October 2008), almost fulfilling Mr. Pattinson's prediction. Scrap the styles as they are now. Both the World Beer Cup and the Great American Beer Festival are celebrations of craft beers. But they are more than that. Organized by the advocacy group for small US breweries, the Brewers Association, these festivals are promotions of the business of craft beer. To that end, let's make them more powerful and effective: to increase sales. For the Great American Beer Festival, let's scrap the categories as they are now —appealing to beer geeks —and come up with styles meaningful to consumers. The current miasma of nit-picked styles means little to most of them. Create a nationally-derived ad hoc committee of brewers and authors and academicians and retailers (and, gasp, consumers) to do so. Put their results to an extended period of public comment. Next, let's dispense with the medal triad of gold, silver, and bronze. As much as I despise numerical scores, in this case —to promote business sales— scores might be preferable. As it is now, a brewery may receive a score a mere point behind a bronze medalist ... and not be recognized for its effort. From a stance of promoting beer sales, that makes little sense. Wouldn't it make more business sense to allow dozens of breweries to display their acumen, with scores in the 90s? The literal winner could still be recognized as supreme in its category. As to the judging itself: if the Beer Judge Certification Program (BJCP) is to be the certification requirement, it needs to be brought under the aegis of the breweries. If such an annexation is unacceptable to that organization, the commercial brewing community needs to create its own program and requirements. For the World Beer Cup, I would propose all of the above, but in concert with brewers' associations from all participating nations. If that would mean that the United States' Brewers Association would lose some control (financial and organizational), that might be a price to pay for a truly international competition. Winter Storm Category 5 Ale is a delicious beer, and I congratulate the brewers of Clipper City Brewing Company for their skill and creativity. But, until the next World Beer Cup —which occurs in 2010— if you wish to brew an "International Pale Ale", you'll need to clone Winter Storm. It's indeed the paradigm of the style ... or so the judges say. The wanton breeding of new beer styles needs a prophylactic. Caveat: I am employed by the Clipper City Brewing Company. However, most of the opinions here are my own. What sort of mental deficient would drink the Stella? No, don't answer that question, I already know the answer. A young trendy with neither a sense of history nor tastebuds. Budvar is sold in the US as Czechvar. Charlie Papazian is a founder of the American Homebrew Association and a powerful force behind the Brewers Association. As such, he has had a profound impact upon homebrewing and craft brewing since the legalization of homebrewing by Jimmy Carter in 1979. According to the U.S. government a 12 oz. serving of “regular” beer has less calories than 12 oz. of apple juice, orange juice, 2% milk and cola. If you are really serious about losing weight and don’t want to drink beer, then drink water. Where the report refers to "regular" beer, keep in mind that beer of 7% alcohol by volume (abv), which is small by today's 'extreme-beer' standards, is itself 30% stronger than "regular" beer of 5% abv. Alcohol provides the greater share of calories in beer. Be that as it may, long die the frumious slander of the beer belly! Kudos! Mr. Papazian practices proper English usage and indents the first line of his paragraphs, a modern grammatical rarity. YFGF commends him and abashedly admits its own typographical sloth. Alerted to Papazian's Beer Examiner blog at Stan Hieronymous' blog Appellation Beer. Award-winning homebrewer Phil Farrell is known for traveling the craft-brewing world and surprising his victims with a rubber chicken (generally benign surprises). I was 'fowled' a few weeks ago at the Classic City Brewfest in Athens, Georgia. Photo courtesy of Phil Farrell. The new Nationals Park neighborhood has undergone much development, including the massive Department of Transportation building, a new hotel, a Starbucks, and chain dining options. Something is missing, though. In the 23 months since the stadium groundbreaking, it seems that no forward-looking entrepreneur thought, "Hmmm. If I got a sports bar up and running by opening day 2008, I'd attract all those fans before and after the games, and give the workers at the Navy Yard and the Department of Transportation and all the new buildings opening down here somewhere to go for happy hour. I'd make a mint!" But now, at least, there's the Kegbus. In today's Washington Post Weekend, Fritz Hahn wrote about this free gameday shuttlebus to the ballpark. It leaves from and returns to various Capitol Hill watering holes. There's not really much choice in good craft or local beers at the three bars, but their beer prices are much cheaper than the $9 Miller Lites at the Nationals. cushioned banquettes that run along the walls, a booming sound system, glowing light-emitting-diode lights, and a large bathroom. Washington D.C. is the host site for the first-ever SAVOR, a national craft beer and food exposition, a culmination of American Craft Beer Week, Friday and Saturday, 16/17 May. Nearly 50 breweries will be participating, with 95 different craft beers, and 35 savory and sweet appetizers. There will not be any hot dogs or pretzels. With epicurean luck, we may successfully demonstrate that fruity/herbal/citrusy hops pair well with citrusy chocolate, and with spicy/sweet mango salsa, and with washed rind cheeses. Meadow Creek is a southern Virginia dairy, located just north of the North Carolina line. Grayson is its aromatic Tallegio-like cheese. And aromatic is the polite term; try foot-stinky (mmm! ), but with a nutty and creamy flavor and texture. Beer and food lectures and demonstrations are integral to the event. SAVOR calls these —in somewhat raised-pinky-fashion— salons. I don't believe Socratic dialogue will be evident! In one session, Dogfish Head Brewery's Sam Calagione and wine educator Marni Old will be reprising their wine vs. beer bout. In another, Hugh Sisson of Clipper City will demonstrate the marriage of beer and Chesapeake seafood, assisted by chefs from the Phillips Seafood restaurants. A few more, as well: jump here for the full list of salons. A couple of years ago, I was asked to participate in the Virginia Beer Cup as a judge: to anoint a craft beer as the best produced in the Commonwealth. I politely demurred, stating that I felt such an activity to be a conflict of interest. Although Clipper City Brewing, for whom I work, is located in Maryland, its beers are sold throughout Virginia. Furthermore, I felt it presumptuous of me to stand in judgment of the work of my peers, from standpoints of both business and artistic. 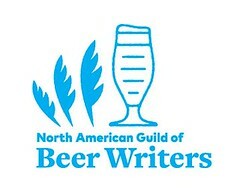 I have never been invited to judge at the Great American Beer Festival or the World Beer Cup or other such professional competitions. But if I were, I would decline. It is not my place, ethically, to do so. (Never say never: I did in fact judge at the 1997 US Real Ale Festival. In hindsight, maybe I should not have. I was the brewer for Cleveland's Local Brewing Company at the time, which had a entrant in the competition. Northern Virginia brewpub Blue and Gold —now closed— won that year with its Union Jack bitter. The US Real Ale Festival, unfortunately, is likewise no more. Beer writer Andy Crouch recently blogged about ethics in beer journalism: a different topic, of course, but one with similar implications concerning conflicts of interest. Positive coverage has so long been the expected standard in beer writing that what little inclination towards criticism or coverage aimed at bettering the consumer’s experience was quickly lost. For a long time, beer writers have believed that criticism means writing that Young’s Old Nick Barley Wine is actually more an old ale than a barley wine (and self-gratifyingly thinking that this is a radical and brave opinion). He stands to lose joint custody of his daughter, and his security clearance job. "At this point, I am very close to the decision to completely give up the best hobby in the world until such time that it is no longer illegal here in AL. This is a decision that I have not taken lightly, but my family has to come first." says Oberman. It's a lazy, rainy, jazz-listening, reading day. I popped open a can of commercial vegetable soup, made with barley (maintaining this blog's beer focus). It was labeled as "Vegetarian Vegetable Soup". How deliciously redundant! I was once offered crab as my vegetarian option at a restaurant: "It's a vegetable," the waiter insisted. In a prescient blog entry just this past Friday, David at Musings Over A Pint mused that "It's always bittersweet when we finish off a seasonal beer" as he enjoyed his last bottle of 2007 Winter Storm. Wild Goose, a gold medal in the English-style IPA category, for its Wild Goose IPA. Rock Bottom Bethesda, a silver medal in the Special Bitter category, for its 1065 Raccoon Red. Rock Bottom Bethesda, a bronze medal in the German-Style Brown Ale/Düsseldorf-Style Altbier category, for its 1065 Fire Chief Alt. Sweetwater Tavern Centreville, a silver medal in the British-Style Imperial Stout category, for its High Desert Imperial Stout. Starr Hill Brewery, a silver medal in the Classic Irish-Style Dry Stout category, for its Dark Starr Stout. Flying Dog Brewery, a silver medal in the American-Style Amber Lager category, for its Old Scratch Amber Lager. Flying Dog Brewery, a gold medal in the American-Style Imperial Stout category, for its Gonzo Imperial Porter. Recognizing the creativity, uniqueness and variety of pale ales produced by innovative brewers throughout the world, entries in this subcategory may represent variations on classic English pale ale or American pale ale beer styles. These beers will bear the most resemblance to English or American pale ale categories with respect to color, general flavor profile and alcohol levels, and will be judged accordingly. Typically specific hop characters define the signature qualities of many traditional styles of pale ales. Many brewers choose to maintain the overall beer character of a particular style, but use new hop types, resulting in new interpretations of “traditional” styles of beer which have unique or non-traditional hop flavor or aroma characters. While many brewers strive to maintain the traditions of certain brewing styles, other brewers seek to reflect the uniqueness of their own beer culture and locally produced ingredients. Beers entered in this subcategory could include, for example, beers inspired by classic English or American pale ale, but brewed with New Zealand or other hops. The brewer must list the classic style on which the entry is based, and may also explain the special ingredient(s) use, and the resulting achieved character or nature of the beer, to allow for accurate judging. Beer entries not accompanied by this information may be at a disadvantage during judging. Caveat: I am employed by the Clipper City Brewing Company. - Tonya Cornett of Bend Brewing Company became the first woman to win “Champion Brewer” honors. She collected two gold medals to earn the title in the “Small Brewpub” category. - Brewers from Japan collected 10 awards to keep company with traditional brewing centers like Germany, Belgium and the UK which collected 25, 11 and 5 medals respectively. - Illinois ranked fourth among U.S. states for total awards won, behind perennial leaders California, Colorado, and Oregon. The rest of the release here. With all the handwringing about the current high price of hops, it's refreshing to find a creative, pro-active response such as this one from the boys at Victory Brewing: contract with a specific grower for hops. Victory Brewing Company, an independent craft brewery located in Downingtown, PA, has brewed three small batch specialty beers at the commission of the German Hop Growers Association. The styles crafted include a Select Pils, Tettnanger Pils, and Sapphire Belgian Strong Ale. Each of these three beers were brewed to showcase the high quality hops produced in Germany to potential American brewing clients. These filtered beers were produced as a collaborative effort between Eric Toft, American-born, German-trained Brewmaster of Private Landbrauerei Schonram, and Victory Brewing Co. The German Hop Growers Association sends Victory the hops, Eric formulates the recipe and Victory brews the beer. The three styles of beer selected for small patch production reflect two areas of Victory Brewing's core strength, lagers in the form of pils and Belgian strong ales. The Select Pils was crafted with a mix of Hallertau and Spalt Select Hops. The final alcohol content rounded off at 5.3% ABV. The second pils, a 5.3% ABV Tettnanger Pils, was brewed with a single hop variety, Tettnang Hops. This hop came wholly from German farmer Herr Georg Bentele, the very same gentleman Victory Brewing founders Bill Covaleski and Ron Barchet visited while touring Germany in 2007 with 23 thirsty Victory fans. The final variety commissioned and brewed was the Sapphire Belgian Strong Ale. This supreme specialty beer was crafted with a Hallertau grown variety hop named Safir. To complement this hop variety and the brew to be created, a Trappist yeast was used in fermentation. The resulting alcohol content amounts to a behemoth 10.5% ABV. "Supreme" and "behemoth" in one paragraph! From an article published in today's Washington Post, about the 'other' wines of makers known for a different style of wine. ... curiosity about what other overlooked treasures we might be missing out on led us to sample whites from Jordan Winery, which makes a celebrated cabernet sauvignon. Andrew especially loved the rich complexity of the 2006 Jordan Russian River Valley Chardonnay ($30), which is fermented in French oak. Jordan's executive chef, Todd Knoll, who devises dishes to pair with the wines, recommends a potage Saint-Germain (pea soup) with Atlantic lobster with this one. But we enjoyed this creamy-bodied white with sauteed chicken in a lemon-butter sauce and with cheese ravioli in basil pesto sauce, the latter of which brought out some nice herbaceous qualities in the wine. I've quoted it here and highlighted certain phrases because the clear implication is that wine fights with salads. Not in the article, but you'll read it here and now: beer does not. It is, rather, a flavorful friend to salads. That being said, here's one caveat. Some beer writers recommend a fruit beer as the proper pairing with salads. But a fruit beer is one of the few beer pairings that does not work well with salad. It doesn't clash with the salad, but vanishes in the acidic wash of the vinegar. A brown ale. There's just enough fruitiness, just enough darker maltiness, just enough nuttiness, and just enough hoppiness (not too much) which all together seems to act as a tasty foil to vinaigrette. We did this for a recent beer dinner at the Olney Ale House. Chef John Leisinring paired his Mixed Green Salad —sundried cherries, applewood smoked bacon, and honey vinaigrette— with Hook and Ladder Brewing's Backdraft Brown Ale. In time for Passover, here's a video from vegan-recipe cookbook author Isa Chandra Moskowitz and her Post Punk Kitchen. She's demonstrating a non-animal recipe for Matzoh Ball Soup. I could write a novel on everything it took for me to perfect this recipe, but instead I will just give you the beautiful results. These are perfect light, fluffy and flavorful matzoh dumplings. Use home made vegetable stock to add tons of love and flavor. I suggest making the vegetable broth the night before. You can even make the matzoh mixture the night before and the big day will be a breeze. You can half the recipe or even third it if you aren't serving the whole mespuchah. If you don't have a huge stock pot (I use a 16 Quart) then half the recipe or boil the matzoh balls in two sessions. I make my own matzoh meal by grinding the matzoh in a food processor (it takes about 6 to get the 1 1/2 cups called for in this recipe) but store bought will work just as well. Two other esoteric items would make them non-Kosher. One is how the yeast is grown. Redhook, the first major brand to be Kosher certified, had to change the medium in which they grew the yeast. Another is the finings that may be used to clarify the beers. Some of the fish finings come from unkosher fish which would make the beer unkosher. —Steve Frank is one-half of the Brews Brothers. 2 With writing partner Arnold Meltzer, his work has appeared in the American Brewer, Mid-Atlantic Brewing News, and other periodicals. This celebration of craft beer in America began as American Beer Month a few years ago created by the Association of Brewers. Now retooled as the Brewers Association (BA), it is the national trade group of small breweries, craft breweries, and brewpubs. But when it created an American Beer Month, it put itself (and us small breweries) in the position of promoting all American beers, including light beers and their North American industrial lager brethren. So the BA reduced the celebration to a week, and limited its purview: American Craft Beer Week. The last is actually on Thursday 22 May. But if Philly Beer Week could stretch its marvelous week to two, why not us? "In addition to being recognized for making world-class beer, independent craft brewers are amazing community citizens," said Julia Herz, a spokesperson for the Brewers Association. "Craft brewers are an integral part of many communities' charitable efforts. They donate to everything from fire departments, disaster relief efforts, local events, educational fundraisers and so much more." Changed to a weeklong event in 2006, the inaugural American Craft Beer Week was recognized by the U.S. Congress with House Resolution 753. In 2007, more than 150 brewers registered their community celebrations at www.americancraftbeerweek.org. Also new, SAVOR: An American Craft Beer and Food Experience (May 16-17) will be held to commemorate American Craft Beer Week in Washington D.C. The event will showcase craft beer and food pairings with participation from 48 independent craft brewers. The prosaically named Neighborhood Restaurant Group —owners of several northern Virginia establishments including the anything but prosaic beer-and-food destination spot Rustico in Alexandria, Virginia— have had plans in the works for several months to open a Washington, D.C. multi-tap beer bar and restaurant. I checked in recently with Rustico's Beer Manager Greg Engert as to the project's status. Greg will be running the show in DC, once the doors open. Due to some foreseen delays, looks like it will be opening in August; the lease is signed, the moneys are in place and the liquor license is ours. [UPDATE 2008.08.20: Restaurant deadlines are inherently fungible. It's looking now like a November 2008 opening. Greg is still planning for 5 handpulled cask lines in addition to all the taps and bottles. Here's an update at Metrocurean. One 'unintended consequence' of the repeal of Prohibition (the 75th anniversary of which we celebrate on 5 December of this year) is the potpourri of laws and regulations concerning alcohol and its sale, different in each of the 50 states (and often within those states). For example, Georgia law forbids me as a representative of a brewery from pouring my own beer at festivals. I must rely on volunteers to pour the beers. And when the caliber and excitement of that volunteer is palpable, the brewery is perceived of well, and thus my business does well. As in any vocation—particularly if it has arisen from an avocation—there is a danger of over familiarity. One can lose a sense of wonder and delight. The business of beer is no exception. Thus reading the comments of the volunteer who poured at Clipper City's table at last week's Classic City Brewfest in Athens, Georgia, was, figuratively, refreshing for me. Thank you to her and to all volunteers. Read her comments here. Today, it's the Hickory Hops Beer Festival in downtown Hickory, North Carolina. There's a 30% chance of rain; better put, there's a 70% chance of no rain, even though there's a thunderstorm producing front expected to drive through later this morning. Olde Hickory's Bardstown Brand Ale, Barleywine Aged in Bourbon Barrels in the Wood & Barrel Aged Strong Beer category. Olde Hickory's Sinatra Barley Wine (aged in stainless steel) in the Ale or Lager Aged for 25-48 Months category. Taco Mac is a nearly 20 outlet chain of multi-tap beer restaurants in Georgia and Tennessee. On Tuesday, a beer dinner to celebrate the 75th anniversary of the Cullen-Harrison Act was held at their downtown Atlanta location. The anniversary actually occurred on Monday (7 April 1933). But as that was the evening of the men's NCAA basketball championship —which indeed was a thrilling game— Executive Chef Drecker had thought it prudent to move things to Tuesday. Clipper City poured from a fresh cask of Loose Cannon Hop3 ale by gravity and from a cask of 2007 Below Decks Barleywine via handpump. The Atlanta Brewing Company was pouring Reverend Mudbone, a golden beer with an incredible aroma. Crystal hops —and lots of them— imbued the beer with not the typical American grapefruit/turpentine hop character but rather deep floral and earthy aromas. One taster exclaimed, "Cannabis!" Other breweries there included Sweetwater and Terrapin (both local Georgia breweries), Left Hand, and Lagunitas. By the way, Tuesday evening was the women's NCAA championship game. Several attendees were enjoying the beers and dinner while taking frequent glances at the television monitors. The Washington Post has expressed bemusement at the sere lack of local beer at the new Nationals Ballpark. When the Senators played at Griffith Stadium from 1911 through 1961, fans probably slaked their thirsts on such regional brews as Senate and Old Georgetown from the District and Nattie Boh and Gunther from Baltimore. The list of high-end bottles includes <...> the only local representatives thus far: Hook & Ladder Lighter and Backdraft Brown from the Hook & Ladder Brewing in Silver Spring. The last two are actually brewed at High Falls Brewing in Rochester, N.Y.
Tom Cizauskas, territory manager for Clipper City Brewing in Baltimore, said he tried to meet with Centerplate (the Nats' concessionaire) on numerous occasions between August 2007 and March 2008 before being given the brushoff. Noting that "we're less than 40 miles away as the crow flies," he expressed disappintment [an amusingly apropos typo] at the lack of local beer in the Nationals' park. In all fairness to the Nationals, their director of business development, Catherine Silver, did try to recruit a local brewer, Capitol City Brewing. The original idea was for the D.C.-based brew-pub chain to operate a beer garden in an alcove on the left-field side. Centerplate would have been in charge of the food. <..> The deal foundered, according to [head brewer Mike] McCarthy and Capitol City regional manager Mark Pearson, because Miller Brewing Co. -- a major sponsor of the Nationals -- objected to signs or banners bearing the Capitol City name. I reported in August of 2007 that the original architectural drawings from the HOK firm had even included plans for an operating brewpub on-site at the ballpark. That would have been an inspired touch, à la Sandlot Brewing, a Coors brewpub with craft-style beers at Coors Field in Denver. But the plans were quickly redacted. The local breweries are here: we can produce the beer; we can have the beer distributed to the ballpark. The lack of outreach is a direct slap at local civic pride. Congratulations are in order for Silver Spring Maryland's brewery Hook and Ladder. The brewery's Backdraft Brown has won the top spot in this year's Washington Post Beer Madness, a judging of 32 beers from around the US (but commecially available in bottles in the D.C. area). In fact Backdraft Brown won against another local beer, The Raven Lager, from the Baltimore-Washington Beer Works. The contest was organized to mimic, in a way, the NCAA college basketball championships, colloquially known as March Madness. A percentage of proceeds from the sale of all Hook and Ladder beers goes to burn victim charities. Forbes reports that large British regional brewer Marston's of Burton-on-Trent has bought out Refresh UK of Oxfordshire, which currently brews Brakspear and Wychwood ("Afraid of a little flavor, lager boy?"). It's a double uh-oh, because Brakspear had been the world's only brewer with a double-drop system. On my few trips to the UK, its buttery beers were some of my search-out favorites. Brakspear, a nearly 225 year-old tradition in Henley-on-Thames, closed its brewery in 2002 in order to concentrate on real estate. The double-drop system was resuscitated a couple of years later at Wychwood Brewery, under the Brakspear name. On a summer evening in 2005, I was on a brews cruise in Annapolis, Maryland. A schooner goes out for a 3 hour sunset cruise; I, as a Clipper City representative, talk about the beers being served. Tough gig, huh? I sat next to a couple from upstate New York. We began talking about cask ales in the US. "You probably have never heard of our favorite beer," they told me. It was, of course, Brakspear. Small world. More recently, I met a couple of chocolatiers in South Carolina. Their prior occupation? Publicans of a Brakspear tied house in the UK. Will Brakspear and its double-drop fermentation system survive now? Will it matter now, ownership being separated from authenticity by several degrees? The new owner of the brand, Marston's, itself has a storied history and a unique fermentation system: the Burton union. I have been in several stateside bars, however, in which I have seen filtered, kegged beer pulled through ersatz beer engines as if the beer were from a cask. The beer was Marston's ... even though the arrangement might have been arranged by the importer, wholesaler, or the pub retailer, independent of Marston's. Such marketing gimmickry does not necessarily bode well for Brakspear. It's the bitterest beer in the world! It seems that every week we hear breathless reports about the newest biggest beer of 100+ IBUs (International Bittering Units) — a beer purported to contain in excess of 100 milligrams of isomerized alpha acids per liter of beer. These claims are usually based upon simple arithmetic calculations, not on more expensive —and precise— spectrophotometric analyses. And then, you'll hear: "It was such a balanced beer for such a high bitterness." Listen to this Basic Brewing podcast interview of John Palmer of Brew Your Own Magazine by host John Spencer. Palmer reports on the International Brewers' Symposium on Hop Flavor and Chemistry, held at the University of Oregon in August 2007. Research by Val Peacock of Anheuser-Busch, among others, debunks some long-held memes of craft-and-home-brewing. For example, an IBU is not necessarily one part per million of isohumulone. It is in fact more inclusive and more externally-affected than that. And one that fascinated me: a 20 IBU beer brewed with hops prevalent in 1968 —the year when many of the current standards were adopted by the American Society of Brewing Chemists (ASBC)— will be perceived to be different, bitter-wise, than a 20 IBU beer brewed from newer hop varietals of today. 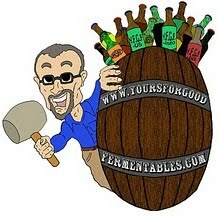 The site is Basic Brewing, essentially a podcast and video blog for homebrewers. But this hop report is, at least, a cursory good listen for many craft brewers. After exceeding expectations in test markets, Miller Lite Brewers Collection -- a trio of craft-style light beers -- is going nationwide. “We are going to take Miller Lite Brewers Collection national and we’re going to do it by September,” Miller Brewing Company CEO Tom Long said from the stage on Tuesday at Miller’s distributor meeting in New Orleans. It’s exceeded volume targets by 40 percent and it’s also exceeded distribution targets. Miller Lite Brewers Collection went into four test markets -- Baltimore, Charlotte, N.C., Minneapolis, and San Diego -- in February. The lineup includes a blonde ale, an amber and a wheat -- each with significantly fewer calories and carbs than typical beers of that style. Miller Lite Brewers Collection is aimed at mainstream light beer drinkers and capitalizes on three beer industry trends: the popularity of light beer; consumers seeking more variety, including crafts; and people willing to pay more for brands that offer a unique experience. More here. from Brew Blog. Bob Tupper —he of the temporarily homeless Tuppers Hop Pocket Ale and Pils— has created a page at his website to list up-to-date information on seasonal beers at all local breweries and brewpubs. Seasonal beers are one of the true delights of living in a vibrant craft brewing area. But I don't know of anyone who regularly keeps track of what's available when. So I'm going to give a try on a page on our website. Fire Chief, a Dusseldorf Style Alt Bier. Brewer Geoff Lively describes it as fiery red in color, medium bodied, malty up front with a clean bitter finish.. Five malts plus Mt. Hood (our favorite) and Tettnang Hops. 4.9%. We liked the balance of malt and hops. The page is really in beta form at present: here. But Bob promises updates as he receives them. If the link doesn't work, go to TuppersBeers.com.